What did you us e for the search description? Are you at stock ride height? No level kit? Have you ran into any rubbing? Where did you get the white color match. I also have a 2018 am am looking for a white deflector. I am looking for the front air dam that goes on a Z71 '17-'18 1500 Silverado as in the picture with the chrome attachment circled. Let me know if you have one you are willing to sell. Looks great. I am looking for the piece you sre showing with the chrome cover on it. If anyone has taken off the complete front air dam off of a 2018 Z71 or compatible, hit me up. I am looking for the upper piece with the chrome in the center. I would need it shipped possibly unless you are in the Central IL area. Have a good one. Looks good. I am looking for the piece you have left on there of the air dam with the chrome still attached. Are those the Chrome or Polished? 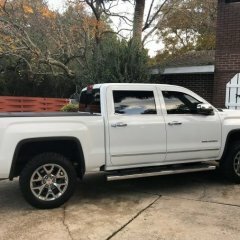 I am looking for a set of GM 20" Snowflake style take-offs for a 2018 Silverado 4wd. If anyone around the area has a set they are getting rid of let me know. Not sure if Chrome Clad or Polished. Who has had any problems with the Chrome Clad.